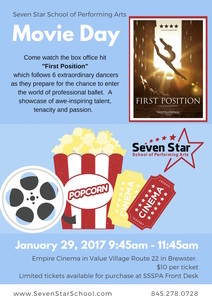 Join Seven Star School's Ballet Director, Miss Anita and watch the box office hit “First Position” which follows 6 ordinary dancers as they prepare for the chance to enter the world of professional ballet. A showcase of awe-inspiring talent, tenacity and passion. January 29 2017 9:45 AM to 11:45 AM at Empire Cinemas in Value Village Route 22 in Brewster. Tickets are $10 per person. The concession stand will be open for purchases. Tickets can be purchased in advance at Seven Star School at 509 Route 312 in Brewster, NY or at the box office at 9:30am on January 29th. For more information call 845.278.0728 or visit www.SevenStarSchool.com.